Eighteen months ago Mike Koenigs was separated 2,542 miles away from his family at the Duke University Medical Center being treated for Stage 3a cancer. He was surrounded by people who were dying and he was fighting for his life. That’s when he became obsessed with the idea of writing a book in case he died, leaving his wife and 11-year-old son, Zak behind. Armed only with an iPhone and with less than hour of strength a day, he wrote, published, promoted, and became a #1 bestselling author in less than 30 days. Since then, using that same system, he has helped over 300 people write, publish, promote, and become bestselling authors too. Mike has simplified the process – with 5 steps to creating & publishing a book…and he’ll also show you the 10 fastest ways to make money with your book. 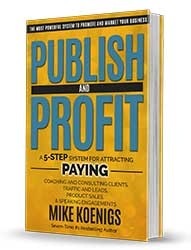 That way you can learn to Publish quickly and Profit wildly. You may think you’ve heard this before or maybe you have even already published a book. But my guess is you also may not have the freedom and authority you wanted when you first started out. It’s ok…and it’s not your fault. What you’re about to see is totally new. So, hang on. You’re about to discover a completely different way to leverage your book…and you’re also about to see how quickly you can achieve the income and results you want. You’re about to learn a completely new model for either starting or enhancing any business – an “Integrated Hybrid System” that is being embraced by small business owners, NY Literary Agents, NY Times Bestselling Authors, experts, speakers, consultants, coaches, CEOs, and entrepreneurs – many who are hearing about it for the first time. And you’ll see irrefutable proof that this works in any business or industry, online and offline, in any language, anywhere in the world. It’s like getting an exclusive VIP ticket to a private members-only club filled with community that enables your freedom and autonomy. 80% of those who say they want a book don’t take action. PS – If you don’t know Mike, he’s the brain behind Traffic Geyser and Instant Customer. He’s also a 6-time #1 best selling author.